Moving time: 5 hr 59 min. Wind: calm for the first half of the ride then the wind kicked up from the south at 10 mph (mostly crosswind but tailwind for 14 miles). Do you know what they have in Kansas? Corn. Do you know what they don't have? Mountains. I did a long day but it went very smoothly thanks to the flatlands of Kansas. I set some records today mainly due to the terrain. Today was the most linear (0.83 linearity), the highest average speed (15.4 mph), and the flattest (average of 18.9 feet of climbing per mile) of the trip so far. Western Missouri and Kansas are flat as a board with a few little bumps to keep things interesting. 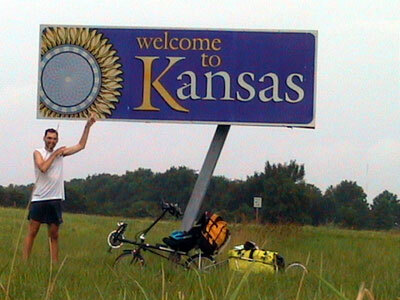 I'm now in the fifth of eleven states in my journey - Kansas. Here's a picture of me at the border. Other cyclists have definitely taken the same picture as I did since the ground in front of the sign has bicycle tire ruts in it. 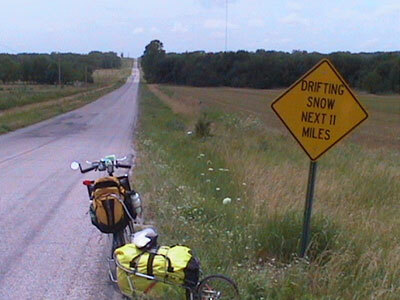 I met a cyclist from Toronto, Ontario who was on vacation here in Girard, Kansas. He was riding his bike for exercise and caught up with me. 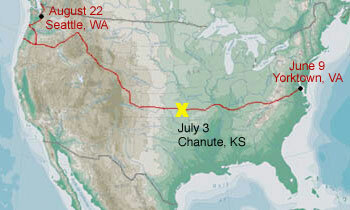 We talked while we rode toward the post office where we met up with another TransAm rider, Jim, heading west. Jim is from Greensburg, PA and is riding from Lexington, Kentucky to Witchita, Kansas for his two-week vacation from work. Each year he pounds out another segment like that. Eventually he'll have the entire TransAm route complete. The three of us chatted for a while about the route and our rigs. I picked up my second mail drop package here. It's a good thing that I made it to Girard today - I forgot that the post offices are closed on July 4 for the Independence Day holiday. Now my trailer is packed full of food and supplies again. I then went to the Pizza Hut lunch buffet for a salad and some carbo-loading for five bucks. Good deal. Kansans are proud of their hills. The post office clerk in Girard warned me of the hills before Walnut but I never saw them. Perhaps he was talking about those 5% grades that I flew over at 10 miles per hour. Kansans are also much nicer than Missourians. I have experienced a great deal of hospitality and good will since crossing the border. When I put the camera back into my bag after taking this picture I realized that my wallet was not in the bag. Not good. I accidentally left it in the store in Walnut when I bought a drink and refilled my water bottle and bag. My heart sank because I had already travelled about 15 miles past Walnut and it would be a 30 mile round trip to retrieve it. I decided to continue on to Chanute (another 15 miles) and call the store to see if they had it - I would then figure out how to get it up to Chanute. When I reached the top of the hill in the distance in the picture a woman pulled off in front of me and asked, "Are you Mr. Flint?" I instantly realized that she had my wallet - and she did. She was in the store when it was found and she knew the route we took so she headed off to find me. I offered her a reward but she refused. She said she was headed to Chanute anyway and knew how much extra work it would have been for me to go back. I offered her my deepest gratitude and she insisted that it was her pleasure to help out. What a great person! When I reached Chanute I planned to stop and see "Yodeling Katy" Lopeman, a legend along the route much like June "The Cookie Lady" Currie in Afton, VA. I stopped in front of her home but it looked vacant. A young man came up to me and told me that she had moved but he didn't know where she moved to. He invited me to stop by at the firework stand he was working at with his church youth group. It turns out that they are using a fireworks sale to raise money to go on a mission trip to Mexico in August. We got talking and it turns out that his father, Rick, and his brother rode from Chanute for Yorktown, Virginia a few years ago. I met Rick a few minutes later and we talked for quite a while about touring, recumbent bikes, and the route. He was very helpful in plotting an alternate route from near Buffalo to near Toronto, Kansas since there is a bridge out in Benedict, Kansas. The bridge is being repaired and the detour follows six miles of gravel roads - something that I cannot handle. It turns out that the paved detour will only add two miles to the segment that I'm planning tomorrow and it takes me to Yates Center which is more populous than the standard route. It's always nice to talk with other cyclists along the way. There's a special bond and deep level of understanding and respect between long distance bicycle tourists. I also enjoyed some hot dogs and soda they had at the stand - thanks! The campground here in town was not shaded very well and it was hot out (what's new). I splurged for a motel again. I've stayed in motels and hostels more than I originally planned on. The hostels are dirt cheap and the motels don't cost much more. If you count the number of nights I've stayed for free, my average lodging expenses are still pretty moderate. I feel dumb hauling the tent and sleeping bag across the country but I know I'll get more use out of them as I continue west. It turns out that the girl who was chosen on The Bachelor is from Chanute, KS. Word around the campfire is that their relationship didn't work out and she made some enemies here in town because she talked trash about Chanute on the show. Food: 1 muffins (440 Cal. ), 1 quart of apple juice (340 Cal. ), 3 cans of Sprite, 2 hot dogs on buns with mustard and ketchup, 1 nectarine, tossed salad with French dressing, 4 slices Pizza Hut supreme pizza, 1 slice sausage pizza, 2 cinnasticks, mini wheats (240 Cal. ), tuna helper (1100 Cal. ), pringles (350 cal. ), 20 dried apricots.